Could there be any more sublime spot on a warm, sunny day than Watsons Bay Tea Gardens? The spectacular harbour views delight the adults, the bobbing yachts and busy ferries keep the children amused. 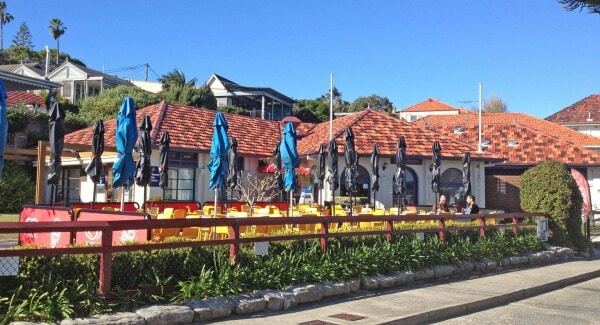 A morning tea, a bit of lunch, a casual afternoon cuppa; the Watsons Bay Tea Garden provides them all in a lovely outdoor setting, with toys for the children laid out on the lawn. An excellent day trip for visitors to Sydney is to take the ferry from Circular Quay to Watsons Bay, have something to eat at the Tea Gardens and then enjoy the baths, nearby playground and a stroll along the shore. Sydney at its best! Read on for all the details you need to know to enjoy your time in and around Watsons Bay. 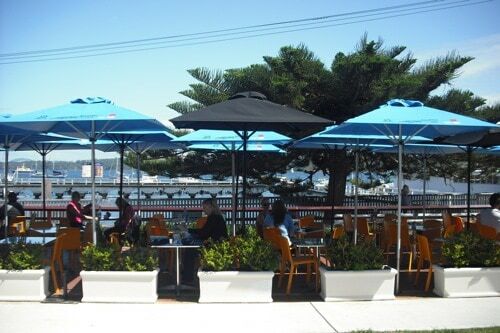 Great views over the Harbour make this a gorgeous spot on a sunny day, winter or summer. Open: Daily breakfasts, lunch and some dinners— check website for opening hours. Bliss! A garden cafe with a low fence all the way round and stern signs on the two gates: ‘Please keep this gate firmly secured.’ The garden has tables with umbrellas in the garden and some inside seating. There is table service. Food and drink can also be purchased to take away. The cafe serves full breakfasts, morning teas, drinks and snacks. Lunch is served from noon: filled baguettes, salads, soup and bagels are all on the menu. Also available are homemade cakes, sweet crepes, banana splits, biscuits and toasts. Cream teas can be ordered. A good range of juices, spiders, smoothies, soft drinks, teas and coffees is available for the young and thirsty. Watsons Bay Tea Gardens revels in wonderful views over the harbour to the city centre, Mosman and Watsons Bay itself. Mum’s report: Great spot to come with friends and family. There’s plenty of space for the children and lots of luscious things for them on the menu. They love the toys in the garden. Robertson Park Playground has been refurbished with super equipment, particularly good for young children. 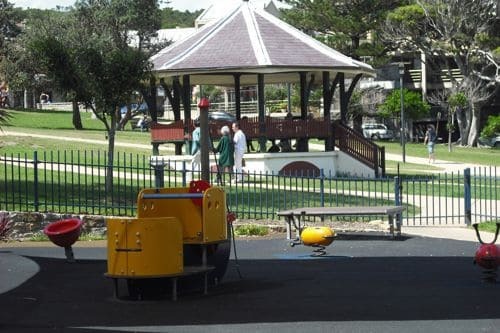 Extra: Robertson Park and playground is a short stroll away, and Watsons Bay Baths is just across the road. Watsons Bay Library is int he same building. Parking: In surrounding streets and around Robertson Park. The traffic can get very congested, especially on sunny weekends. Watsons Bay Tea Gardens just opening up on a sunny winter’s day. Do you have a fave family-friendly cafe?